Dynisco is a world leader in developing innovative, high-quality solutions for plastics extrusion processing for 60 years. Through engineering excellence built on the expertise of an engineering staff that averages 15-20 years experience, Dynisco sensors, controls, and analytical instruments have proven to offer better control, reduced downtime, minimum scrap, and unmatched reliability and working life. Today word ‘Dynisco’ stands for reliability, accuracy and highest level of performance. The PT460E Series transducer is a ±0.5% sensor ideal for melt pressure applications requiring simple installation, repeatability and reliability. The PT460E transducers provide the industry standard 3.33 mV/V signal designed to work with most pressure indicators. The PT460E comes equipped with a six pin bendix connector. Optional thermocouple or RTD configurations are available to provide melt temperature. The PT460E features a 1/2-20 UNF thread for installation in standard transducer mounting holes and can be supplied with a variety of other electrical connections if desired. The Echo™ Series of melt pressure sensors offer quality performance and value for plastic processing utilizing standard configurations and pressure ranges. Echo sensors are designed to meet customer requirements by providing a combination of economic value and performance for general extrusion applications while providing a ±0.2% repeatability when measuring process pressures. Use Echo Series sensors when the application requires a quality measurement for optimized control, but not the costs of all the extra features. The PT410 Series transducer is a ±0.25% sensor ideal for food or medical applications requiring high accuracy, simple installation, repeatability and reliability. The NaK fill material meets the requirements set forth by both the FDA and USDA for contact with food and medical products. The PT410 Series transducers provide the industry standard 3.33 mV/V signal designed to work with most pressure indicators. The PT410 comes equipped with an eight pin bendix connector. Optional thermocouple or RTD configurations are available to provide melt temperature. The PT410 features a 1/2-20 UNF thread for installation in standard transducer mounting holes and can be supplied with a variety of other electrical connections, if desired. The PT46X4 Series pressure sensor is a ±0.5% sensor ideal for general melt pressure measurements requiring simple installation, repeatability and reliability. The PT46x4 sensor provides the industry standard 4-20 mA amplified signal designed to work with DCS and PLCs. The PT46X4 comes equipped with adjustable zero and span side-mounted potentiometers. PT46X4 Series mA sensors can be rezeroed in two ways: locally via the zero potentiometer, or remotely via shorting two pins together (contact closure). Optional thermocouple or RTD configurations are available to provide melt temperature. The PT46X4 features a 1/2-20 UNF thread for simple and easy installation in standard transducer mounting holes. The PT46X6 Series transmitter is a ±0.5% sensor ideal for general purpose melt pressure measurements requiring simple installation, repeatability and reliability. The PT46X6 transmitters provide the industry standard 0 - 10 Vdc amplified signal designed to work with DCS and PLCs, 1 - 11 Vdc outputs are also available. The PT46X6 comes equipped with zero and span pots to adapt the transmitter to process conditions. 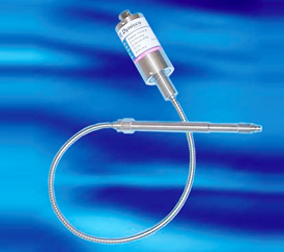 Optional thermocouple or RTD configurations are available to provide melt temperature. The PT46X6 features a 1/2-20 UNF thread for installation in standard transducer mounting holes and can be supplied with a variety of electrical connections. The SPX2291 is a smart 4 - 20 mA button seal pressure transmitter designed for use in hazardous locations. The SPX2291 is all welded construction that features a large diaphragm and mounting flange for easy installation. Optional thermocouple or RTD configurations are available to provide melt temperature. The SPX2291E has explosion proof approval for Class 1, Division I, Groups A, B, C & D. The explosion proof model employs a conduit fitting with 42” leads. The SPX2291S is ATEX/Intrinsically Safe approved for II 1 G 100a Eex ia IIC, Zones 0 and 1. The intrinsically safe and ATEX models can be supplied with either a conduit fitting or a hermetic 6 pin Bendix connector. The SPX2243 is a smart 4 - 20 mA pressure transmitter designed for use in hazardous locations. The SPX2243 is an all welded construction that features a small diaphragm and a mounting flange for easy installation. Optional thermocouple or RTD configurations are available to provide melt temperature. The SPX2243E has explosion proof approval for Class 1, Division I, Groups A, B, C & D. The explosion proof model employs a conduit fitting. The SPX2243S is ATEX/Intrinsically Safe approved for II 1 G 100a Eex ia IIC, Zones 0 and 1. The intrinsically safe and ATEX models can be supplied with either a conduit fitting or a hermetic 6 pin Bendix connector. 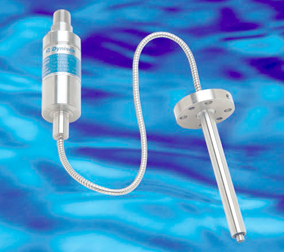 The SPX 2242 / 4222 is a smart 4 - 20 mA pressure transmitter designed for use in hazardous locations. These amplified transmitters eliminate the need for external signal conditioning. All models can interface directly with distributed control systems, PLCs, computers and similar high level control devices. Optional thermocouple or RTD configurations are available to provide melt temperature. The SPX 2242 / 4222 is ATEX/Intrinsically Safe approved for II 1 G 100a Eex ia IIC, Zones 0 and 1. The SPX 2242 / 4222 features a 1/2-20 UNF thread for installation in standard transducer mounting holes and can be supplied with a variety of electrical connections. 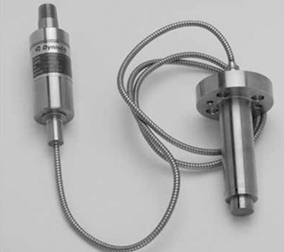 The SPX-T is a smart 4-20mA pressure transmitter that includes Temperature Compensation and DynaLarity™, a Dynisco innovation. The SPX-T delivers the best spec performance in the line. Temperature Compensation is based on a primary RTD measurement that compensates for temperature variations which reduces temperature-related drift and increases accuracy. No need to re-zero for temperature changes after installation. DynaLarity uses an advanced algorithm that linearizes offsets due to process effects on the sensor. Combined Temperature Compensation and DynaLarity reduces temperature-related drift by as much as 80% and improves accuracy by more than 60% over other sensors. Process temperature output is available. HART communication is standard. Explosion proof, Non-incendive and Intrinsically Safe configurations are pending approval. The SPX3391 is an all-welded construction that features a large diaphragm and mounting flange for easier installations. The 1480 is a Universal Pressure or Temperature Input Indicator with single or dual configurable alarms, as well as optional linear retransmission of displayed Process Variable. Ideal for use in Extrusion applications. The 1490 is a Universal Input Indicator with single or dual configurable alarms, optional linear retransmission of Process Variable, Transmitter power supply option as well as optional Modbus communications. The UPR900 is a compact 1/4 DIN process indicator. 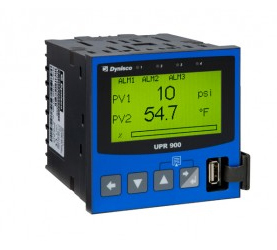 The UPR900 can display your choice of engineering units related to a selectable range of input types. Add an optional secondary input for an all-in-one display of polymer melt pressure and temperature. The secondary input can be strain guage to indicate differential pressure measurement. The UPR900 includes two standard assignable alarms with the option to add a 3rd. The LCD graphical display allows for easy reading of trending graphs with user selectable monochromatic configurations. The UPR900 is easily field-configured, can be programmed remotely via optional Modbus RS-485 or can be programmed with BlueControl software. 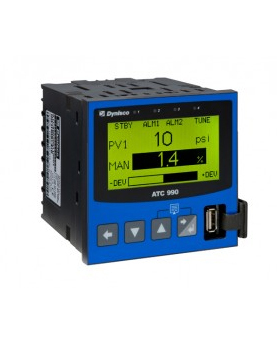 The ATC990 with a graphical/text LCD display is a universal input process controller with advanced functionality including Trend views as well as Digital Inputs, USB and data logging options. It provides a cost-effective way to control a single process parameter, such as for a plastics extruder. Designed to improve user efficiency many features are integrated to reduce commissioning time, simplify operation and minimize maintenance downtime. Reliably auto-tune and alarm on strain guage, DC voltage, temperature or current inputs. The ATC990 can also control differential pressure when an optional secondary strain gauge input is used. Other useful display information includes alarm set points, peak values, error conditions, and engineering unit beacons. The controller provides a quick and easy set-up which includes a step by step configuration wizard which starts automatically on the first start up. An optional 24Vdc output supply is also available. The Model BP420 burst plugs are designed specifically for use in plastic extrusion systems. Burst Plugs (also known as rupture disks) are designed for reliable, emergency relief of excess pressure in a system. The Model BP420 will instantaneously rupture at a specific, predetermined pressure and temperature. Each one piece assembly consists of a 304 stainless steel body with a welded Inconel rupture disk. The disk is flush with the tip of the burst plug with no cavity for product build up. A burst plug may be specified for primary relief in applications where pressure build-up can occur so rapidly that the response time of a relief valve is inadequate,such as in a polymerization reaction vessel. All burst plugs are tested at rated burst pressure and temperature. In addition, markings on the burst plugs are laser engraved and more visible, and each burst plug is labeled and shipped in a protective package. 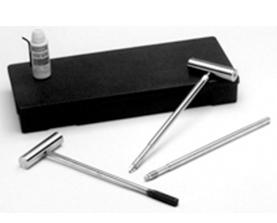 The cleaning tool kit was designed by Dynisco for use in removing excess plastic from mounting holes for pressure and temperature transducers. Installation of transducers into improperly cleaned or sized holes is one of the major causes of damage to these instruments. With this kit, the .312" tip diameter hole, the 45 degree seating surface, and the .451" hole can be cleaned. 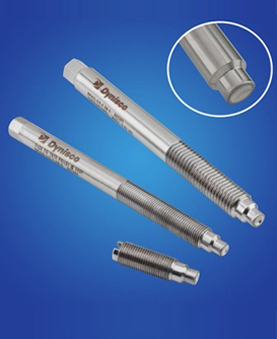 The kit includes a gauging plug which is used to verify that the hole has been correctly machined and cleaned. M10 and M18 cleaning kits also available. The Transducer Mounting Hole Machining Tool Kit contains all of the necessary drills and taps to prepare a standard 1/2 - 20 UNF transducer mounting hole. The kit contains the special pilot drill required to machine the 45 degree seat. 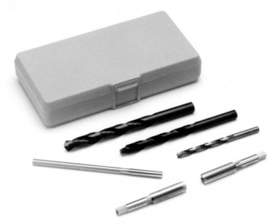 All tools included in this kit are made of premium grade, high strength tool steel. Care should be taken in the use of proper speeds and feeds, lubricants, and a method to assure continual alignment of each progressing tool. Consult Dynisco for additional or more specific information. M10 and M18 kits also available. The cable assemblies provide the electrical hookup from the transducer to the display instrumentation. The assemblies consist of a transducer mating connector and a length of shielded, 6 conductor cable with stripped leads.